My tiny hometown is bisected by railroad tracks. Every Sunday I prayed for a long freight train to block the street to our dismal and hateful church. I counted the passing freight cars, noting the names of distant rail lines: Maine Central, Chessie, Norfolk Southern, Southern Pacific, Northern Pacific, Union Pacific. With the passing freight cars came kaleidoscopic artwork from (I believed) the dark and gang-infested rail yards of big cities. Railroad graffiti* is impossible to miss. 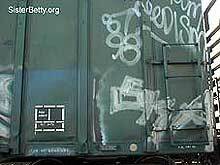 A railcar in a dark rail yard provides a valuable target for vandals. Graffiti artists consider railcars the ultimate canvas: a moving exhibition for talent and effort. I dislike graffiti in cities. Unlike murals, graffiti is often poor quality and declares the decline of a neighborhood. More frequently, talentless and reckless taggers destroy property. Despite my Quaker leanings, caning seems a lovely solution. My opinion of railroad graffiti is different. Most railroads in the United States were built nearly a hundred years ago. Cities and industry surrounded railroad hubs and then spread outward, often leaving rail yards in the dirty, industrial and working class neighborhoods. Here the presence of graffiti is less decay than distraction. Properly planned and executed, quality graffiti becomes a permanent, nationwide, mobile exhibit of artistic talent. In between endless cars festooned with bold signatures, pieces of true quality reflect the ability of nameless artists. The largest modern art gallery in the world is carried by steel wheels on steel rails. I've not spoken to a railroad executive about graffiti. I suspect graffiti creates both problem and expense for the railways. Graffiti covers the signage on railcars and markings showing when the car was serviced and due for inspection. Graffiti removal is expensive and requires a car be removed from service. Perhaps this is why so many cars bear so much artwork. 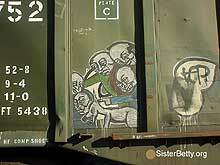 I began photographing railroad graffiti in 2003 as part of my continual exploration of trains and railroads. Photographing graffiti is more difficult than it may seem. 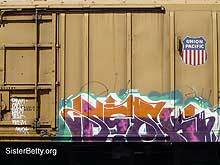 The best graffiti is carried by the largest railroads. Photographing artwork on a moving train is impossible. Major rail yards are not safe for casual tourists, are often cordoned off from the public, and now have ridiculous levels of policing as a result of our ill-named Department of Homeland Security (simply photographing a train from an overpass can draw the attention of local police). A quality telephoto lens is the best tool for these images. I organize railroad graffiti in four categories: tags, stencils, signatures, and pieces. Tagging is the least creative or interesting category of railroad graffiti. Taggers scrawl their "tags" quickly without much effort or thought. I rarely photograph tagging as it lacks imagination, skill and talent. 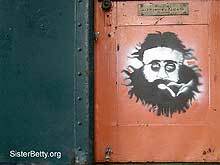 Railroad Graffiti is a featured section of SisterBetty.org. Explore more here.